What is a ‘prunt? Reflections on Vahni Capildeo’s Venus as a Bear. lights prunted below looped eyes. This poem comes from the section ‘Shameless Acts of Ekphrasis’, which leads me to consider, first of all, the notion of ekphrastic writing and then to enquire more generally about the practice of poetry. ‘Shameless’ implies an expectation of shame. Why should ekphrasis, the practice of writing a poem prompted by a work of art, be considered shameful? Is it because it is a form of borrowing or piggybacking, exploiting the achievement of another’s creation to give substance to one’s own? This is hardly a valid criticism since all art borrows, or to put it another way, places itself in some sort of cultural context. Perhaps the most famous modern example of ekphrasis is Auden’s “Musée des Beaux Arts; another which comes to my mind is Robert Duncan’s ‘The Fire –Passages 13’. Poets have always written in response to other works of art; Keats’ ‘Ode on a Grecian Urn’ may have been based on a specific work, never identified, or a generalisation derived from the recently arrived Elgin marbles and other Greek sculptures and artefacts., some of which he drew. However, we might also remember Keats’ assertion that poetry should ‘come naturally’; at present, ekphrasis is in vogue, and there is a danger of it declining into a workshop prompt, a method of forcing poems that do not need to be written. For me, the test of an ekphrastic poem, is whether it stands on its own. Yet even here, there is a difficulty: the poet may be writing from a different or wider cultural framework than that of the reader. Is she therefore obliged to elucidate all the references in her poem? Obviously, this would be very restrictive; moreover, it begs the question of for whom or why the poem was written. I shall come back to the issue of why these poems have been written but first I would like to consider the idea of audience. The poet’s ideal reader might be a clone of herself, someone who would get all the references, make all the links and appreciate the intention. This reader would also be very bored as much of the pleasure of a poem comes from constructing our own reading of it, independently of the writer and the writer’s purpose. However, the reader may be frustrated when the poem is just too strange, when there doesn’t seem to be enough common ground between reader and writer for the reader to construct their reading. For example, I found the title poem of this collection totally baffling because I was unfamiliar with the Bjork lyric ‘Venus as a Boy’. Admittedly, knowing this did not take me much further forward as I still don’t understand where the bear comes from. Nevertheless, the poem locates itself at the Old Royal Naval College in Greenwich and appears to be exploring the plight of the cabin boys, who are here presented as victims, an exploited underclass ‘at-risk youth, the trafficked, the fanatics, then known as cabin boys.’ There are hints that the boys, whose voices are ‘treble, breaking, broken’ are at risk from sexual predators “I don’t care to probe the why or wherefore of Lord Nelson’s last words, “Kiss me, Hardy”’ The difference in status between the cabin boy and Lord Nelson is made clear: ‘He wipes his nose on cambric; I wipe mine on my sleeve.’ The cabin boys who are given a voice in this poem are presented as deluded in the same way as Blake’s Chimney Sweeper boys in Songs of Innocence. Both have been given illusory promises of salvation, in this case, reinforced by doses of rum, the sense of duty and a misidentification with the Lord Nelson and the Lord God. Why ‘Venus as a bear’ should represent salvation, I don’t know, but there is a sense of gender blurring or even species blurring in the climactic repetition of the last few lines: “For they believed in beauty; yes, in Venus as a bear; wanted a manifestation; wanted Venus to give salvation; yes, Venus as a bear.’ For what it’s worth, Venus in these lines is in apposition to duty and both are seen as a route (mistakenly?) to salvation. This poem also appears in ‘Shameless Acts of Ekphrasis’ so I am assuming that the artwork is the statues mentioned in the poem, although there could also be a reference to some of the paintings in the Old Royal Naval College. I have found enough in this poem to give me a sense of understanding; besides which, I find its language pleasing, especially the verbal patterning and the collocation of words that fit together through connotation and association, for example, the chapel ‘full of marble caramel, salted with statues’. ‘Salted’ works brilliantly because it connects to caramel and at the same time suggests the sea and that the statues of these boys are a minor ingredient but provide flavour. Again the phrase ‘treble, breaking, broken’ is dynamic with the present participle ‘breaking’, indicating that the boys are passing through puberty but also that they are being forced to endure until the word mutates to the past participle ‘broken’ which suggests that they have been broken, or that they are now ‘broken in’ or that they are now adults whose innocence has been lost. Other poems totally elude me. ‘Fossil Trade, for Maya’ is one such. It appears as one of a group of poems, all ‘for Maya’ and consists of a block of words in 12 lines of four columns. I do not know whether to read the poem horizontally or vertically, and I can only guess at meanings. The word ‘trade’ occurs 21 times, once as the last word in the first and third columns, nine times in the second column and ten times in the final column. I begin to guess that there is some connection to the slave trade as I spot the words ‘bead’ and ‘trick’ which remind me, perhaps inappropriately, of the Grace Nichols poem, ‘Taint’. I spot other pairs of words: ‘mote/beam’, water/fire’, ‘mother/father’, ‘bread/breast’, ‘trade wind’. I am not sure what to make of ‘fossil’ except that, again probably randomly, I am reminded of Mary Anning, the 19c. fossil collector of Lyme Regis, and the burgeoning trade in fossils arising from the growing interest in palaeontology. Perhaps all the poem is doing is showing us that anything anywhere can be traded, through foul means or fair, by anyone, and that trade is universal. There is private reference in the poem, and I feel that even its block shape is resisting me. I experience this sense of exclusion in other poems and this disturbs me, as I am impressed by the strength and seriousness of Capildeo’s writing. I am forced to ask myself if I am too old, too straight (not just in terms of sexuality), too white or too ignorant to be able to access this poetry fully. The blurb for her previous collection, Measures of Expatriation, quotes Capildeo’s words: ‘Language is my home, I say; not one particular language.’ This is a claim for which she is better qualified than most with her background in linguistic studies and Old Norse as well as her work for the OED. It is an understandable statement from a poet whose own heritage and experience is so diverse in relation to a book which pursues the issue of identity. It is as if language becomes the commonwealth available to all. However, access to this world of language is more equal for some than for others; Capildeo uses the resources of language to construct her own constantly developing idiolect, and thus, in a sense, her self. Measures of Expatriation is a weightier, more painful volume than Venus as a Bear, perhaps because the personal seems less detached. There may seem to be a danger when a poet commits herself so wholly to the world of language that the physical world and the actual will be left behind. This does not happen in Venus as a Bear which opens gently with a series of animal poems to which most readers can relate and which includes a number of pieces where relationships with friends are embodied in a recognisable manner so that we come to trust her approach to language as sometimes playful but always exploratory. In the sequence ‘Riddles’ the poems are often allowed to develop through sound echoes and associations in order to find their shape and their reference. I don’t know the answer to this riddle, but that is not really the point. The pleasure is in trying to make the links and work it out, rather like the tortuous process of ratiocination on Radio 4’s Brain of Britain quiz programme. I note the phonic transition from ‘Ruthless cornfield’ to ‘Writless canefield’. The first makes me think of Ruth in the ‘alien corn’, therefore of migration, while the second with its ‘canefields’ takes me back to the Caribbean. I have no idea what the Lotus signifies although Google informs me that there is an Indian company, Lotus CCTV –whether or not that is simply coincidence, I don’t know. We are told it is Christmas and there seem to be both a lot of children and a lot of activity –‘Dodges’ and ‘self-rearranging furniture’ but diversity returns in the shape of ‘polytheistic plastic’. I don’t know exactly what is going on in any of these poems but each takes its place as a locus in the field in which Capildeo works. Again in the blurb, we are told that Venus as a Bear ‘collects poems’ on various topics, but this is to suggest less coherence than there actually is. The poems are firmly located in the world, a fact stressed by the appendix where the poet names the places which are associated with many of the poems. Some poems are not listed and some appear more than once. This device reinforces the impression that the poet is using her poetry to map her being in the world, and who she is might be described as the line of best fit through loci or, alternatively, a constantly evolving dot-to-dot outline. So if I conclude that Vahni Capildeo’s purpose in writing is both self discovery and self creation, I have to ask again why we might choose to read this poetry. It will not suit those who are looking for ‘what oft was thought but ne’er so well-expressed’ since it is poetry which forces us to think in new directions and often to guess at meaning. It will not suit those who are looking for ‘the language really used by men(or women)’ because the language in these poems is often esoteric and academic. It is poetry which destabilises patriarchy as well as the persisting colonial heritage and is designed to make us think in ways which may be uncomfortable but will allow us better to understand the diverse nature of the world in which we live. 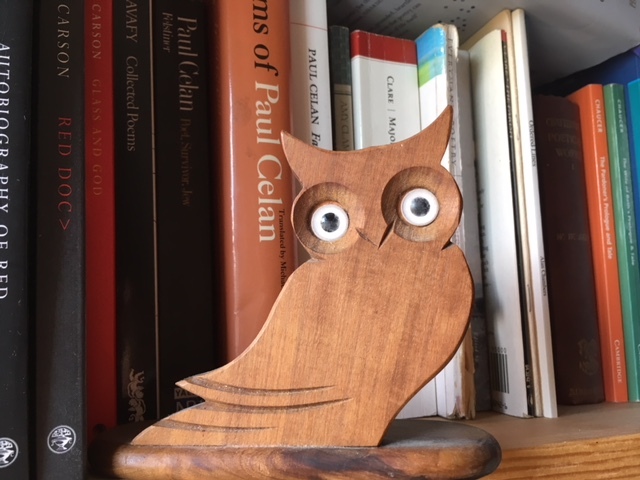 Author poetry owlPosted on August 10, 2018 August 10, 2018 Categories UncategorizedTags Forward Prizes, language, poetry, Vahni Capildeo, Venus as a BearLeave a comment on What is a ‘prunt? Reflections on Vahni Capildeo’s Venus as a Bear.